Once a year the small town of St Péray wakes from its slumber. 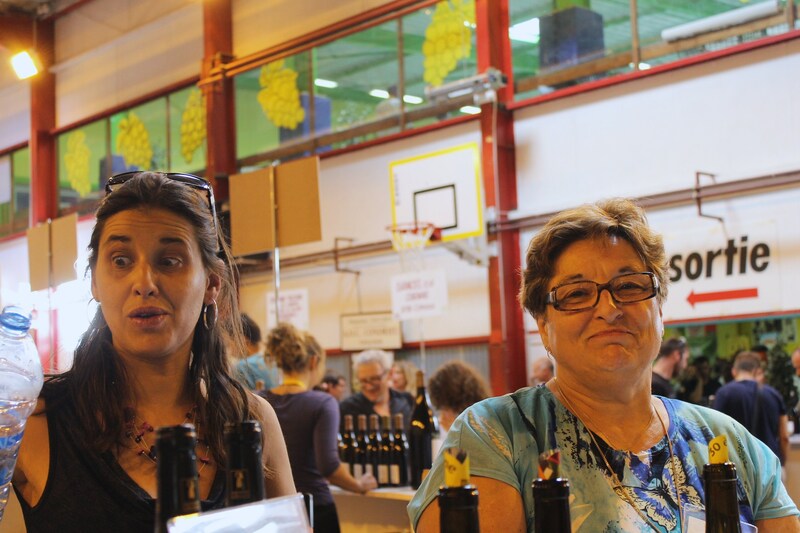 At the start of September the local winemakers gather for the annual wine fair and then, within days, the grape harvest begins. By mid-October, everything is back to sleepy normality. St. Péray is a white wine-only appellation making still and sparkling wines from the local marsanne and roussanne grapes, but the wine fair welcomes plenty of winemakers from neighbouring Cornas, Crozes-Hermitage and St Joseph, as well as a few who have travelled from further afield, so there’s no lack of choice if you prefer reds. 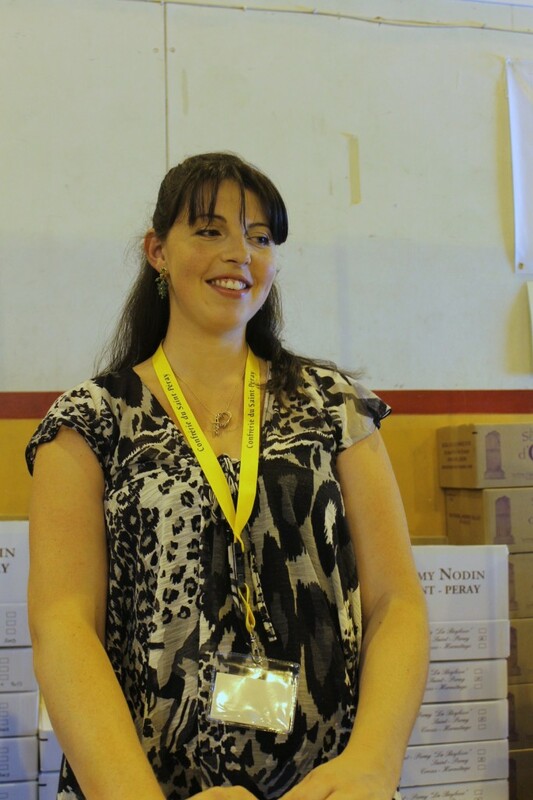 This year there were more than 70 producers present and hundreds of different wines. It’s impossible to list them all, so here are a few of my favourites. 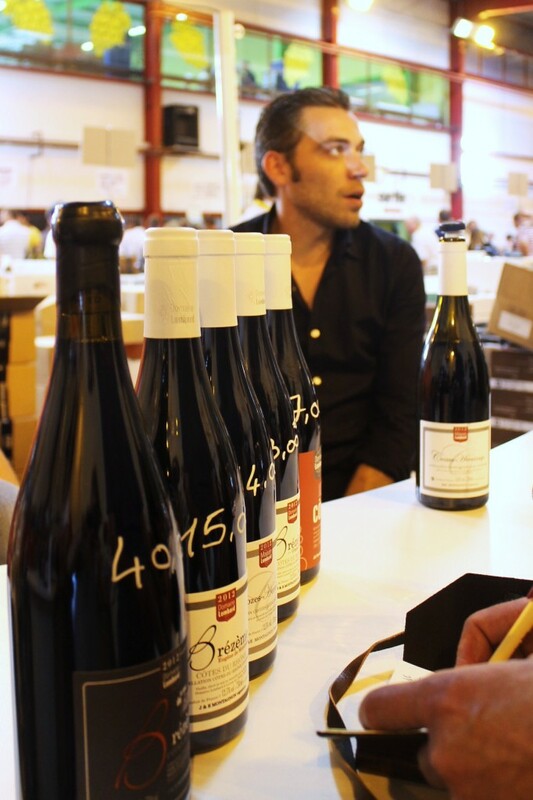 There’s another, better-known estate called simply Domaine Courbis, also making St. Joseph. But I liked Gérard’s chalky, brambly, mid-weight St. Joseph Tradition 2012. 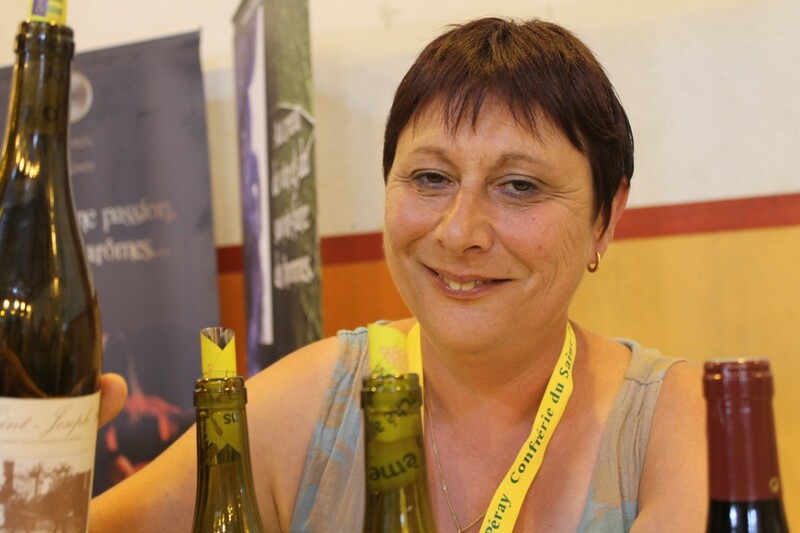 Hélène Chouvet, based on the outskirts of Châteauneuf-du-Pape, has vineyards there and at Vacqueyras and Gigondas, too. But it was her Muscat de Beaumes-de-Venise 2011 that I particularly enjoyed – rich and sweet, tasting of honey and apricot jam, with a bright, pineapple-like acidity. 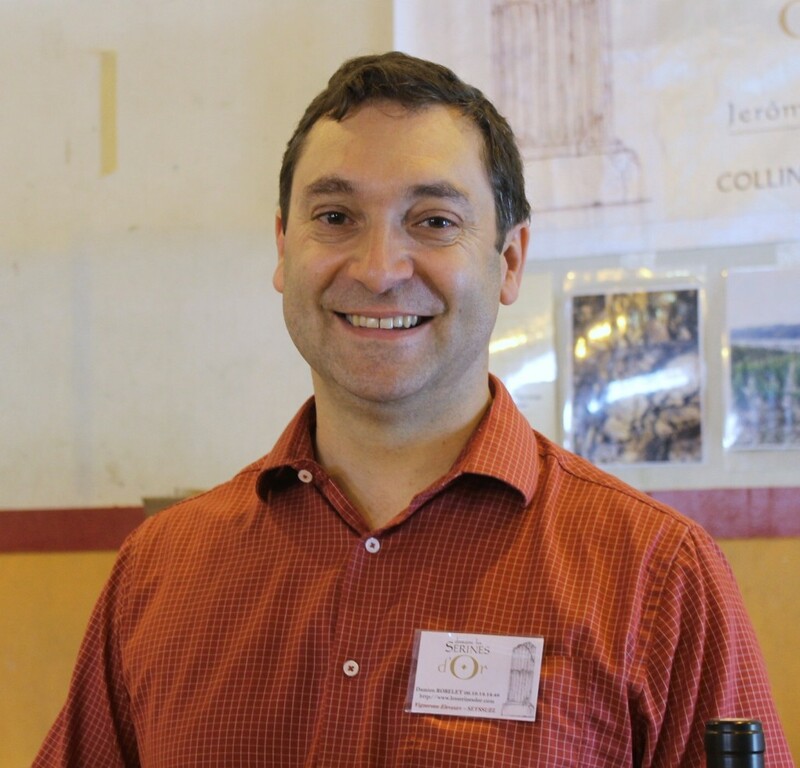 Maxime Gourdain’s Côte-Rôtie Classique 2011 is highly enjoyable and at 30€ good value (sorry, that’s just the way it is when it comes to C-R pricing). Mid-weight, with a subtle richness and flavours of black cherry, hedgerow fruit and a touch of coffee bean. It’s still young though, so a bit of patience is going to be required (and even more so for the 2012). This is Madame Naudin – Rémy is her husband. Rémy Nodin’s St. Péray Mousseaux Extra Brut is the best St. Péray fizz I have ever tasted. The purity and almost chalky dryness are delicious. The still St. Péray “La Beylesse” 2012 is 100% marsanne from 30 year old+ vines. 11 months oak ageing has left its mark without masking the crème anglaise and yellow plum fruit. 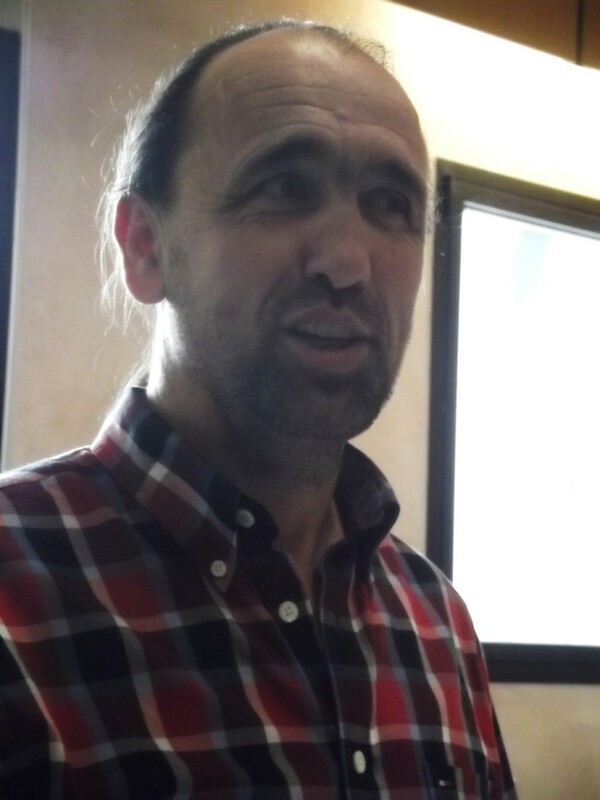 His Crozes Hermitage “Le Mazet” 2013 and St. Joseph “Guilherand” 2013 were my first chance to taste serious(ish) northern reds from a challenging vintage. Because of cool, wet spring weather, the vines flowered late, the grapes’ development was delayed and harvest didn’t start until October. There was always a chance that the northern reds especially would feel thin and under-ripe. 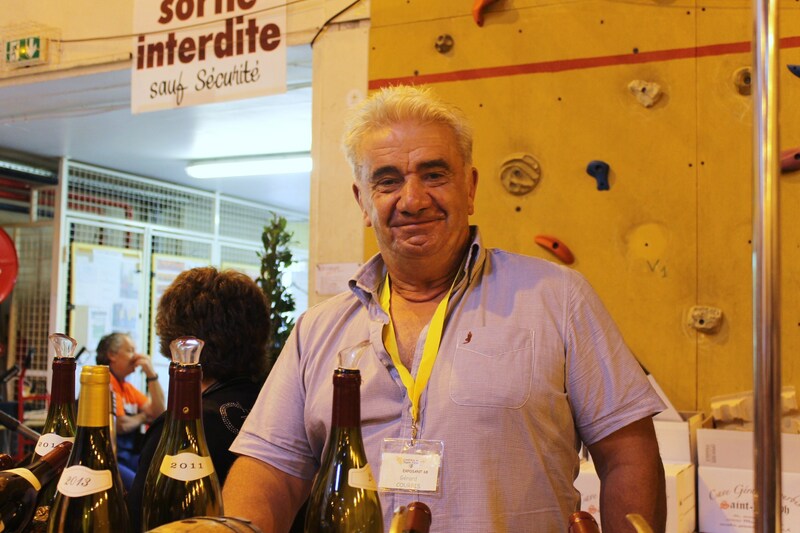 But there was no need to worry, at least if Rémy’s wines are anything to go by – his Crozes is dark, creamy and ripe. Black cherry meets flowers and licorice. The St. Jo, as it should, has more angular tannins and more noticeable acidity, and is a really good example of northern Rhône syrah. The two wines are proper reflections of their different terroirs. Johann Michel in his tasting room. Johann’s St. Péray 2013 isn’t as rich as the 2012, but even so the fresh acidity is nicely balanced by classic marsanne creaminess. It’s dry but makes me think of toffee apples (plus a hint of fennel leaf). “Not terrible” was Johann’s joking comment. Jérôme Ogier and Damien Robelet have their vines in Seyssuel, a vineyard area that could be even older than nearby Côte-Rôtie (so let’s say 2,000 years+) but one that has only been resurrected in the last twenty years after almost a century of post-phylloxera abandonment. Jad’Or 2013 is 100% viognier. Powerful violet aromas come through after initial stone fruit. Oak doesn’t dominate at all, just lends a bit of breadth to the mid-palate. It’s 25€ at the cellar door, but I’d have to say worth it – many Condrieus (what is the plural of Condrieu?) would fall far short of this. For me, the EncOr cuvée has too much oak ageing to allow the syrah fruit to really sing. Serines d’Or 2010, on the other hand, despite spending 30 months in barrel, can handle it. The style is modern, rich and velvety, with deep, dark fruit, but it certainly still tastes like a northern Rhône red. And better than many Côte-Rôties. 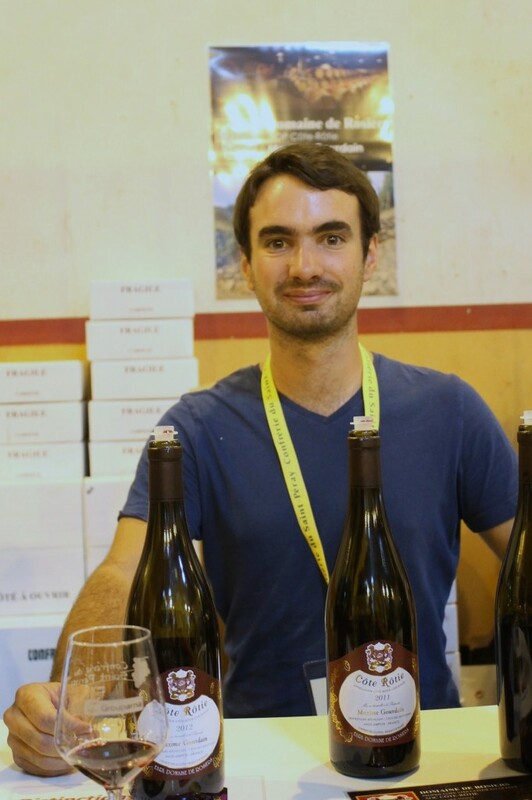 Julien Montagnon and his wines. And me making notes. Interesting to taste the Croze-Hermitage 2012 and Brézème “Eugène de Monicault” 2012 side by side – same vintage, same grape (syrah) and same alcohol level (just 12.5% – hurrah!). 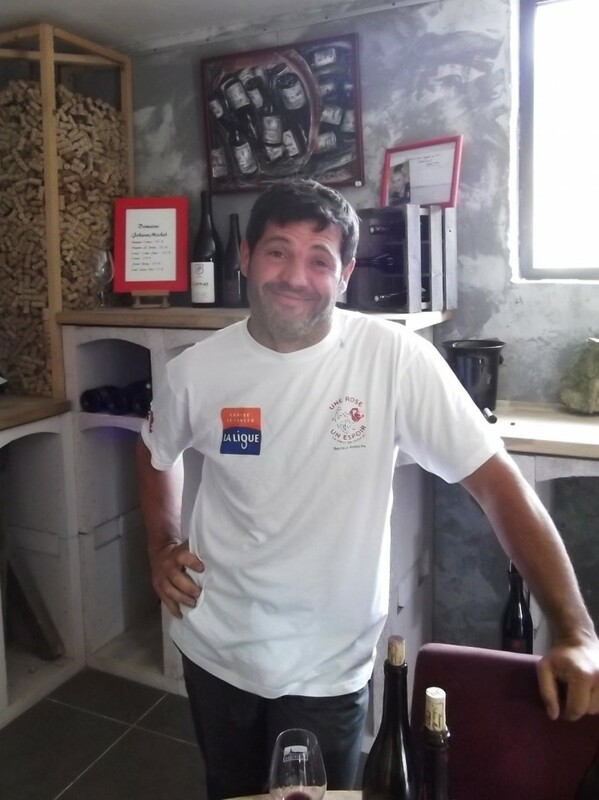 C-H is the better known wine region and Julien Montagnon’s is bright, pure and floral. Lovely wine. The Brézème is fuller, richer and more structured. It, too, is excellent. There’s just a one euro difference in price, so it all comes down to personal preference. Sylvie Desbos. Not the best photo ever. Sorry Sylvie. I know these wines well, but that didn’t stop me from stopping by to taste Sylvie and Philippe Desbos’ St. Joseph Blanc 2012. 100% unoaked marsanne, it’s a lovely combination of apple turnover and acacia flower. As sweet as that may sound, it’s absolutely dry. 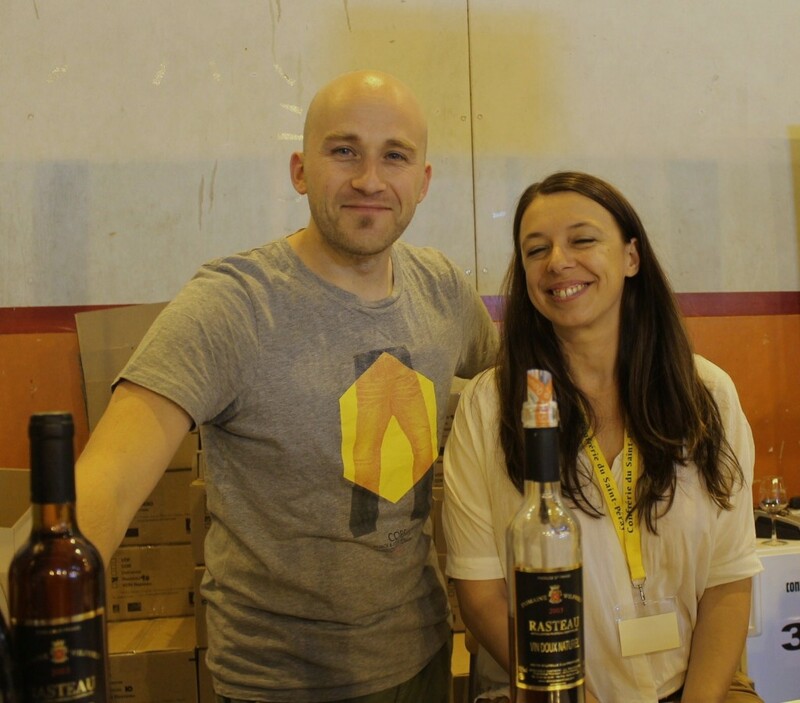 Réjane Pouzoulas leads the estate with her brother Wilfried, but at the fair she was with her husband. Again I know Wilfried’s wines, but I don’t get to taste the Rasteau Vin Doux 2003 very often. And what a treat – deliberate oxidation gives the wine its walnut-like character, while there’s plenty of confit orange rind in there too. Like Christmas in a glass, it would be amazing with a piece of Stilton. Elie makes just one wine. 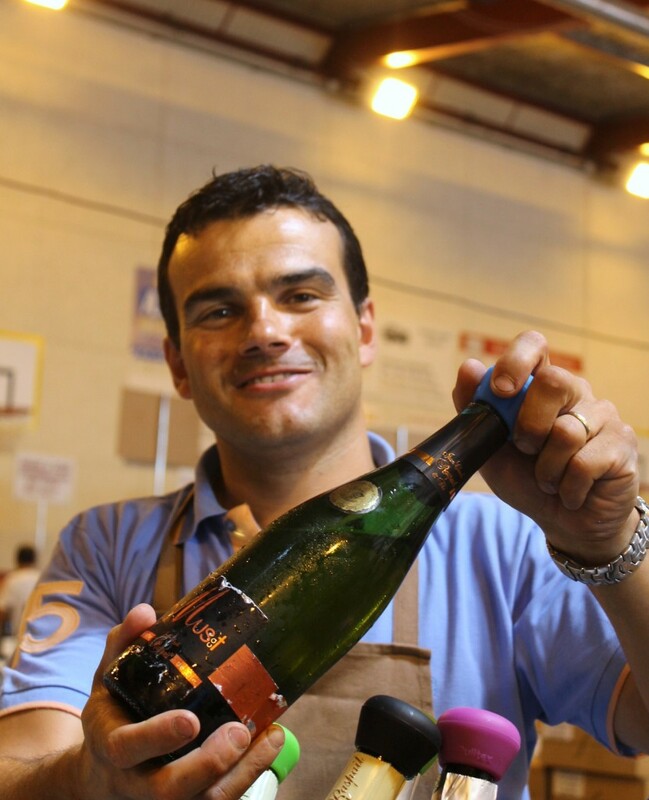 His Cornas 2012 is very traditional – a bit rustic, slightly grainy with spicy hedgerow fruit. It reminds me of a dusty country lane in summer. It runs against almost everything that modern wine is supposed to be. So I liked it a lot. Emmanuelle with two blokes with not much hair – Alain on the left and me on the right. 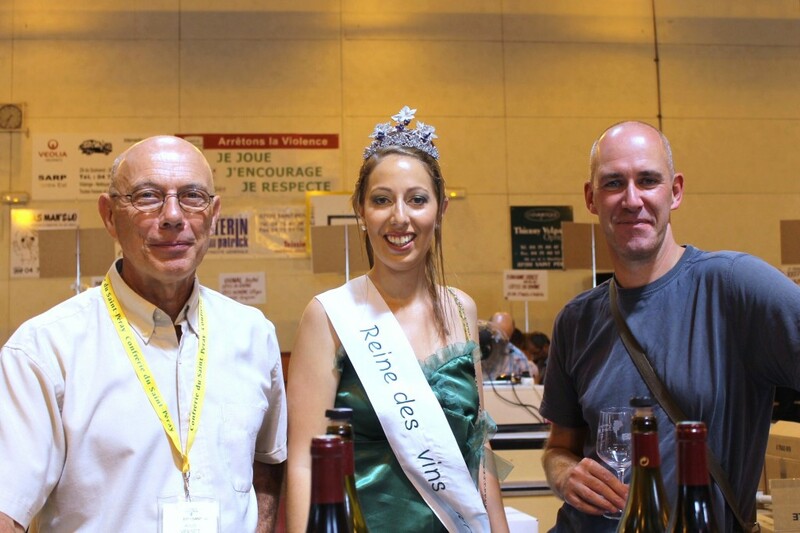 Alain’s daughter Emmanuelle had been named St. Péray Wine Queen and was dressed for the occasion while Alain was busy showing off his Cornas 2009 and 2010. 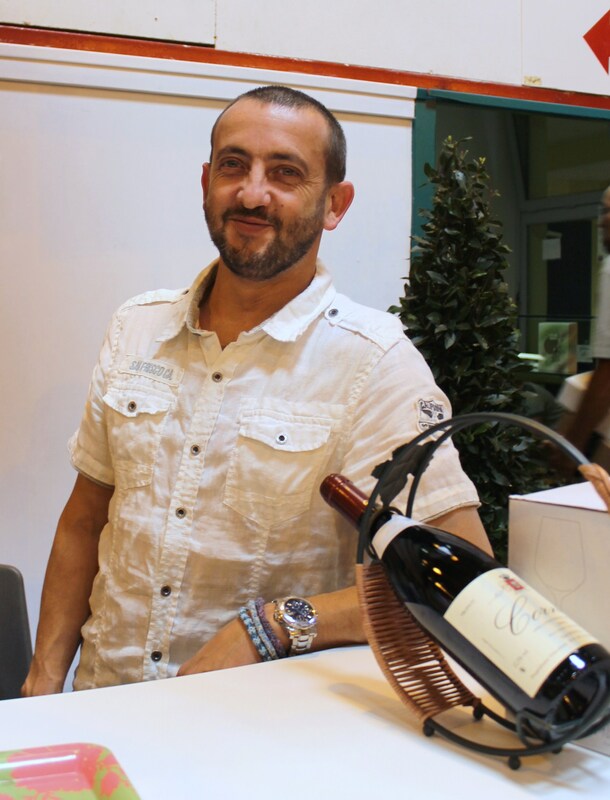 In some ways the style is similar to Elie Bancel’s – Alain makes traditional tannic Cornas – but the wines are darker fruited and spicier, more exotic on the nose. Both vintages are still young, so for now I’ll carry on drinking my dwindling stock of ’06, ’07 and ’08. (Yes, I do like his wines). For one reason and another I hadn’t managed to meet up with Jacques all year, but we bumped into each other in the café at the wine fair and I did at least get to taste his wines. St. Péray Cuvée de l’Elégance 2013 was my favourite St. P of the day. It really is elegant, with great balance and expertly judged oak. Creamy with ripe pear fruit and just a hint of bitter almond. Delicious. Jacques’ Cornas 2012 isn’t the biggest, and in style is as far removed from Elie Bancel’s as possible. Silky, refined, subtly rich with red berry fruit. 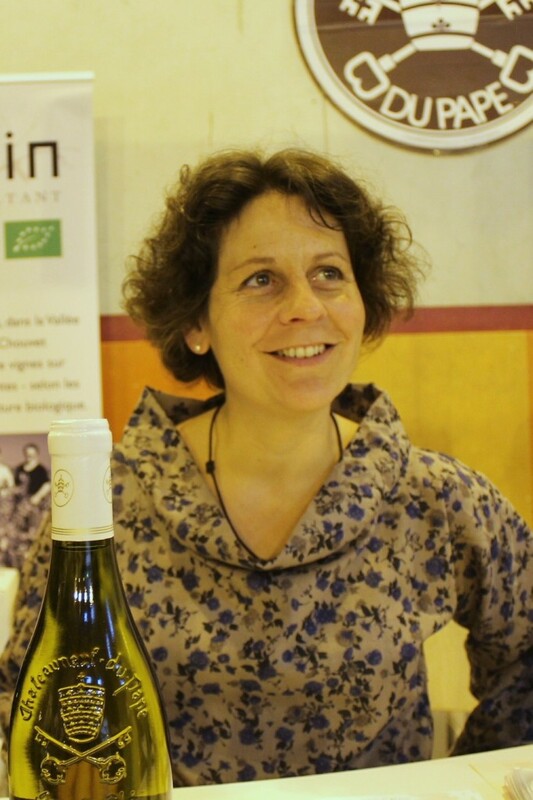 Christelle Betton’s white Crozes-Hermitage “Crystal” 2013 has a creamy texture and a spicy, mineral finish that reminds me of Hatzidakis’s Santorini whites. Very good, but her Hermitage “Arpège” 2012 is something else again. Stunning wine, with greengage, yellow plum, acacia, toast and smoke. The palate is rich, powerful and structured. You can drink it now with pleasure, but I suspect it’s got a ten year life, and then some. 40€ and worth every penny (or cent). There is no need to analyse Frédéric Raspail’s Clairette-de-Die Tradition too closely. Just enjoy it for what it is – a delicious, smile-inducing sparkling wine that tastes of apples and elderflowers. Fred is the best producer of Clairette there is. End of discussion. Not all of these producers export their wines to the UK and/or USA (Domaine de Gouye, for example) but many of them do. If you want to find the wines near you I would suggest looking at www.wine-searcher.com or googling the producer’s name. This entry was posted on Wednesday, September 17th, 2014 at 8:29 am and is filed under Tasting Notes, Wine Fairs, Wine Villages. You can follow any responses to this entry through the RSS 2.0 feed. Both comments and pings are currently closed.